Virgin Atlantic encourages people to break the daily routine and discover the joy of flying in its latest advert, released with the tagline “Depart the everyday”. 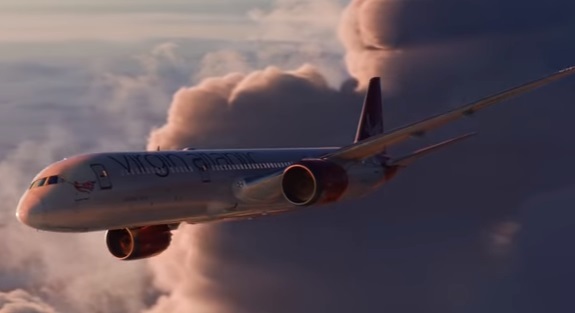 Created by the agency AMV BBDO and directed by Salomon Ligthelm, the spot opens with a Virgin Atlantic aircraft taking off while cloudy days are announced for UK. The plane gets up in the air through the storm to reach above the clouds, where passengers are experiencing surrealist things, from rainbow ice cream dispensed by the air vents and tasted by T-shirt prints that come to life, to wind in their air as the plane turns into a sort of convertible, to lack of gravity. The airline’s signature Upper Class bar and suite are also featured, with shots aimed at illustrating the comfort and the premium experience passengers get to enjoy while flyging with Virgin Atlantic. The Statue of Liberty winking to the pilot is among other elements included in the ad, which is set to Chaka Khan’s 2018 single “Like Sugar”. Unveiled earlier his year, in June, the song will be included on the fourthcoming album due out later this year from the singer, also known as the “Queen of Funk”, who hasn’t released an album in eleven years. The new advert from Virgin Atlantic, which had its TV debut in the UK during “The X Factor” on ITV on Saturday, 15 September 2018, is supported by a separate TV campaign by Virgin Holidays, titled “The World Is Your Playground”.